Custom printed notepads provide business owners with a low-cost and effective way to regularly expose customers to their brand. Unlike less useful promotional materials such as stickers and toys, customers are more likely to use notepads on a regular basis, ensuring greater brand awareness. This guide will discuss the benefits of using custom printed notepads and how business owners can use them effectively. Many businesses distribute promotional materials such as branded magnets and t-shirts to help build goodwill and increase brand awareness. However, some promotional materials are less useful than others—in fact, some are downright useless! A visit to the average tradeshow can leave a guest with an armful of branded pens, stress-relief balls and key chains, among other things. While some people might find utility in certain items, many promotional materials are often thrown away or simply forgotten about. Ideally, a promotional item should be something its recipient could use on a regular basis, ensuring regular and long-term brand exposure. Basic utilitarian items are best for this, with notepads coming out on top. While each industry has its own “basic item,” notepads are nearly universal; everyone needs to jot down a note at one point, and a branded notepad provides an easy way to do so. Promotions: Business promotions often coincide with special events such as grand openings, sales, and other customer outreach efforts. By distributing notepads to attendees or even including them as free gifts with purchases or sign-ups, customers can take home a useful tool that will regularly remind them of the brand. Giveaways: Most businesses can’t afford to spend too much money on products that don’t generate immediate revenue. 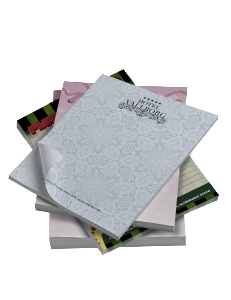 Notepads provide a perfect solution by maintaining low production costs while also ensuring regular brand exposure. Schools: Notepads are one of the staples of the classroom, and students and teachers alike are bound to use them regularly. Offices: Just like custom stationery, distributing custom printed notepads around an office ensures consistency and a look of professionalism across the company. Seminars: Handing out branded notepads before a seminar allows the audience with a convenient way to take notes while also giving them a “gift” they can take home and use later. Meetings: Meetings almost always require their attendees to take notes. Offering branded notepads before the meeting will help attendees keep track of their thoughts and help maintain a professional first impression for visitors. Electro Image provides businesses with graphic design and custom printing for a wide range of branded notepads. With various sizes and quantities available, Electro Image’s full-color notepads come in 25 or 50 sheets of either 70lb premium uncoated or 70lb linen uncoated pages supported by sturdy chipboard backings. 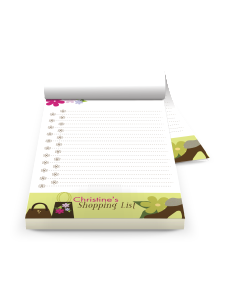 Low per-unit costs and a fast production time make custom printed notepads the perfect promotional item for any brand.